Indoor Dog Swimming at its Finest! Register your pet online using our online registration form. Make an appointment for your first visit where we will orient you on how things work. Please bring a copy of a current rabies vaccination certificate for each dog you wish to swim. NOTE: You only need to register your dog one time. Take your dog for a swim! Join the fun! 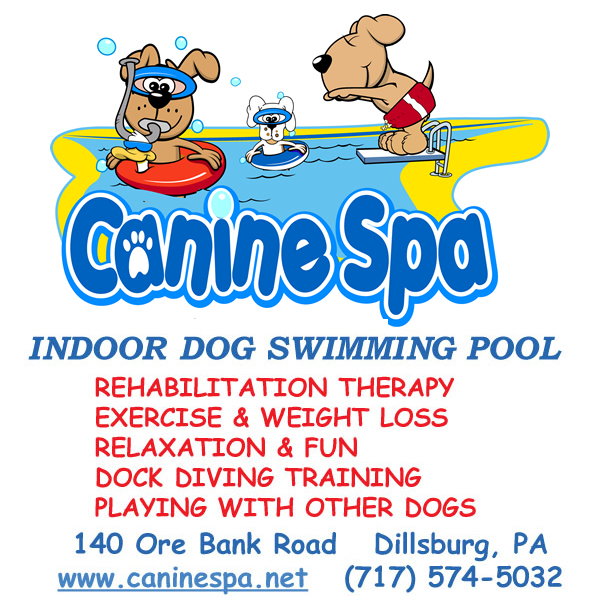 Socialize your dog with other guests in our pool. Life vests and leashes available, if needed. $5 for each additional dog thereafter of same ownership. $10 without swim (If you clean up the wash area when you are finished, the price remains $7). You MUST register your pet and go through the orientation before your dog can use our facility. 7 AM to 11 PM everyday of the year. We're seeing BLUE! 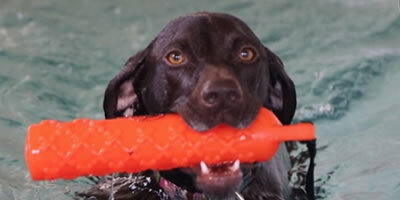 Congratulations go out to Kevin Landis - the Canine Spa's own dock diving instructor and his tremendous dog Gabe. Kevin and Gabe brought back first place blue ribbons from dock diving competitions at Timonium's Pet Expo at the end of January and Harrisburg's Sportsman's Show early in February. 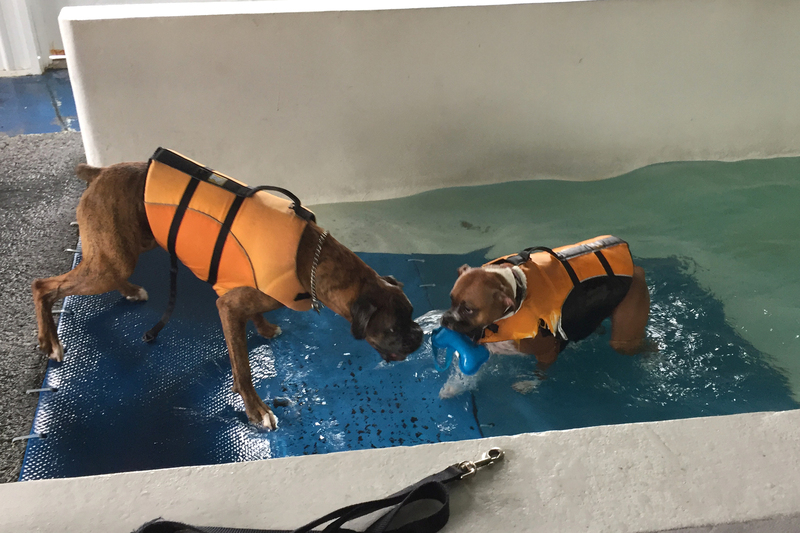 When Gabe first arrived at the Canine Spa, he couldn't swim and was afraid of the water. Now he's a rock star! Way to go Kevin and Gabe! 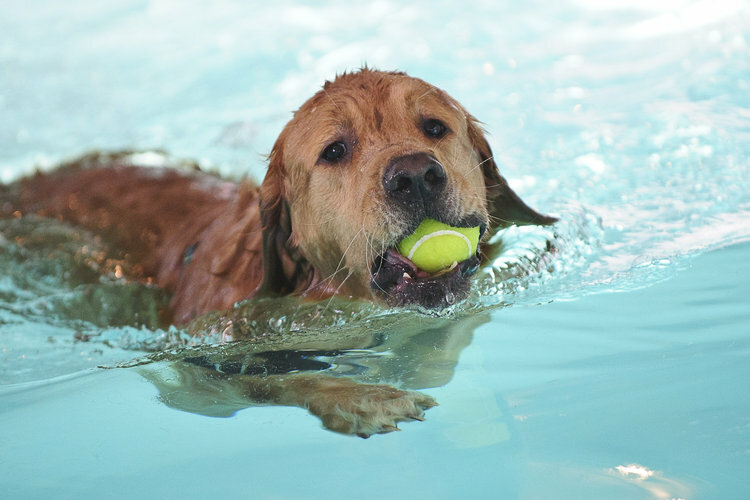 We offer swimming for recreational purposes (exercise, interaction with other dogs, and playtime); therapeutic reasons (rehab from surgery, arthritis); and for weight loss. Enjoy special time with your beloved pet in our facility! 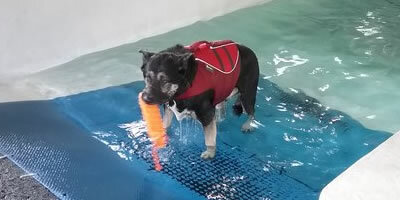 We offer rehabilitation therapy for injured dogs or those recovering from surgery; aerobic conditioning, or weight loss! Whether it's Big Air Diving or Extreme Vertical Jumping. Travis and Dillion competing at the World Pet Expo in Md. 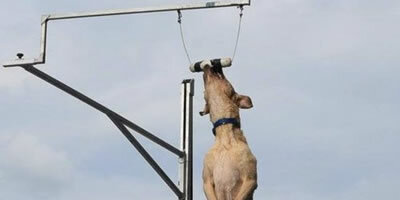 The top 3 Extreme Vertical dogs of the event all started and practice EV with us at the Canine Spa.